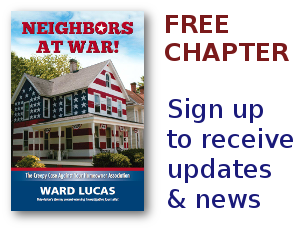 HOA Embezzlement Archives - Page 135 of 135 - Neighbors at War! A Homeowners Association Dating Scam? No Comments on A Homeowners Association Dating Scam? Sometimes it hurts too much to cry…so you just have to laugh…and give ’em the publicity they so richly deserve. It’s another embezzlement from an HOA. The suspect is 62 year old Nancy B. Walker of Boonsboro, Maryland. Details aren’t crystal clear yet, but investigators claim Mz. Walker filched from $100,000 to $137,000 from the Ballenger Creek Meadows Homeowners Association. It seems she was involved in an Internet dating scam and was wiring the money to a man in South Africa. Just an idle question, here: How low does your I.Q. have to be to qualify as the HOA board member in charge of the the neighborhood treasury? But in a massive number of Homeowner Associations, someone on the inside is embezzling staggering sums of money, all of which have to repaid by the homeowners. If the crook is caught, the judge generally orders restitution, but that’s just pro forma. It rarely happens. When homeowners are forced to make up for the stolen money, for all intents and purposes it’s a direct devaluation of every home in the neighborhood. A staggering number of communities across the nation have Homeowner $B!G (Bs Associations. Twenty percent of all American homes are in HOAs. But that belies the read figure. Almost 100% of all NEW homes are in Homeowners Associations. That’s because developers cannot get permits to build unless they agree to create restrictive covenants that subsume some of the traditional duties of government. It’s a form of tax-shifting. Instead of additional taxes, you pay neighborhood ‘dues’. It doesn’t feel like taxes, and it doesn’t create some of the legal complications involved in raising taxes.